New research data shows that more than 90 percent of sea salt sold across the world contains microplastics. Researchers believe that most people consume nearly 2,000 bits of microplastics each year through salt. Sea salt is produced by the evaporation of seawater and contains minerals and antibacterial properties. Sea salt has many uses in cosmetics, and you can use sea salt in home remedies to improve your skin’s appearance. Natural preparations containing sea salt can help treat acne, cleanse your skin from impurities, and exfoliate your skin. Dead Sea salt is another type of sea salt that you can use on your skin. Mineral-rich Dead Sea salt can help treat skin conditions like eczema, psoriasis, and dry skin problems. The anti-inflammatory effect of dead sea salt can also alleviate pain from joint inflammation in rheumatoid arthritis. 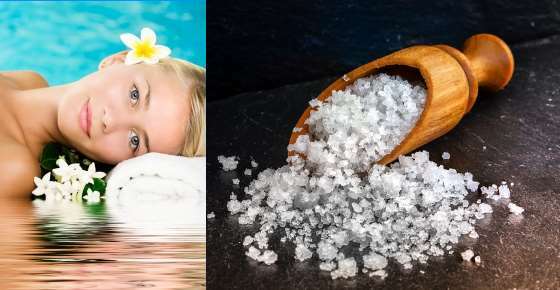 In this article, you will learn about the benefits of using sea salt for your skin. I will also examine what scientific research reveals as to the skin-rejuvenating benefits of Dead Sea salt. You will also find out how to make body scrubs, face masks, and skin-detoxifying sea salt cleansers. The unrefined sea salt is harvested and used in cooking, cosmetics, and as bath salts to help soften skin. Sea salt can come in varying degrees of coarseness which makes it great for use in cosmetics. Microplastics are extremely small pieces of plastic smaller than 5 millimeters that are formed when bigger plastic items disintegrate. A scientific study analyzed 39 salt brands from 21 countries, including the U.S. and China. The results were alarming: more than 90 percent of salt contained microplastics. While sea salt may not be the best option to consume internally, it has a lot of benefits when used externally. Here is why saltwater is really good for your skin. Is Saltwater Good for Your Skin? The reason that saltwater is good for your skin is that it is a natural detoxifier. Minerals in saltwater from the sea help to absorb toxins from the skin, soothe the skin, and retain moisture. Let’s look in more detail at the many benefits and uses of sea salt. You will also find helpful home remedies on how to use sea salt for your skin. The antibacterial properties of sea salt along with its trace minerals mean that sea salt can be used as a topical acne treatment. Doctors from the Mayo Clinic report that salt water compresses can help to relieve skin inflammation and discomfort caused by infected pores. (6) So, sea salt can also help reduce the appearance of acne pimples on your skin. Take 1 cup of fine sea salt and add 1/2 cup of almond oil or grapeseed oil. (The texture of the sea salt should be fine and gentle to the touch, as you don’t want it to scratch your skin but gently exfoliate the dead skin cells). Add 10 – 12 drops of tea tree essential oil to boost the anti-acne effect of this sea salt scrub. Dampen your face or another area of skin where you have acne. Take some of the sea salt acne scrub and gently massage into your skin. Leave for 5 minutes to let the salt and tea tree oil kill off acne-causing bacteria. Rinse with cool water and pat your skin dry. There are many more natural face masks for acne that you can use to get rid of unsightly pimples. The hydrating effect of sea salt along with other natural ingredients can help fight against oily skin. One way to get the benefits of sea salt for oily skin is to add lemon juice to a facial scrub. Lemon has an astringent effect on the skin and can help to reduce the amount of sebum on the skin. Sebum is the oily substance that protects the skin’s outer layer. Mix equal amounts of fine sea salt and lemon juice to create a smooth paste. Take some of the sea salt and lemon scrub on your fingers and gently massage into cheeks, forehead, and chin to help remove excess oil. Leave for 5 minutes to help remove toxins from your skin. Rinse with cool water and pat your face dry. Apply your favorite natural moisturizer to prevent your skin from drying out. Use once or twice a week to help keep your skin looking great. Learn about more uses for lemons and how they can revolutionize your health. The coarse texture of sea salt can help to remove dead skin cells and prevent them from clogging pores on your skin. Adding carrier oil to the sea salt also prevents skin from drying out because it helps retain moisture in your skin. Sea salt exfoliation is possible if you mix the coarse grains with a carrier oil of your choice. For example, coconut oil is a great natural oil to help moisturize your skin and keep it looking healthy. The antibacterial effect of sea salt also helps to prevent infections in your skin. Mix 1/2 cup of fine sea salt with 1/2 cup of coconut oil and 1/4 cup of sweet almond oil to form a paste. (You may have to slightly warm the coconut oil so it becomes liquid). Add a few drops of lavender oil to add a pleasant aroma and help kill off bacteria from your skin. Apply some of the sea salt scrub to your skin and using circular motions, gently exfoliate your skin to remove dead skin cells. Use the sea salt exfoliator once or twice a week for best results. Find out about other great uses of coconut oil to get glowing, healthy-looking skin. The cleansing effect of sea salt on your skin can help to detoxify your skin and prevent skin infections affecting your appearance. You can easily make a skin toner using a simple combination of finely ground sea salt and water. As this article has already shown, sea salt solutions have antibacterial properties that can benefit your skin. Put one teaspoon of fine sea salt in a small spray bottle and add 4 fl. oz. (120 ml) water. (The best way is to boil water and let it cool to remove any impurities). Shake the spray bottle well so the sea salt dissolves. Spray a fine sea salt mist on to your skin, making sure to avoid your eyes. Use once or twice a day to help keep your skin free of bacteria and grime. Learn how you can make other skin toners using apple cider vinegar (ACV). The healing properties of sea salt can help to reduce redness and discomfort associated with skin inflammation. Mix 3 teaspoons finely-ground sea salt with 5 teaspoons raw honey to make a smooth paste. (Adjust the quantities as needed). Apply the sea salt mask to your skin, taking care to avoid your eyes. Leave for 15 minutes to help soothe irritated skin. Soak a clean washcloth in warm water and place over the sea salt/honey paste and leave for 30 seconds. Gently use the dampened washcloth to remove the sea salt mask. Rinse with cold or warm water and pat dry with a clean towel. You can find out other ways to use honey in face masks to help you get glowing, youthful-looking skin. Adding sea salt to your bath can help treat symptoms of eczema and larger areas of inflamed skin on your body. Fill your bathtub with warm (not hot) water. Add one cup of sea salt to your bath water and swish it around to dissolve the salt. Soak for 10 to 15 minutes to soothe your skin irritation, reduce itching, and help treat dry skin. Pat yourself dry with a soft, clean towel. Of course, you can also benefit from a sea salt soak if you don’t have eczema. Bathing in sea salt is very relaxing and a great way of releasing stress from the day. If you suffer from dermatitis, learn about other natural home remedies to treat the symptoms of eczema like itching and dry skin. You can also use sea salt for your scalp to help keep your scalp healthy and free of dandruff flakes. The antimicrobial properties of sea salt are excellent for killing off pathogens living on your scalp. Also, the coarse texture of sea salt helps to exfoliate your scalp to get rid of dead skin cells. You can also add other ingredients to the sea salt scalp treatment to boost its effectiveness. For example, you can add aloe vera to coarse sea salt to help treat dandruff. Mix 3 tablespoons of medium-coarse sea salt with enough aloe vera gel to make a fairly thick paste. Take some of the sea salt/aloe vera dandruff remedy in your fingers and start to work it into your scalp. Continue until you cover all your scalp. Leave for 10-15 minutes to help kill off dandruff causing fungi and soothe your itchy scalp. Rinse with warm water to remove the dead skin cells. Repeat 3 or 4 times a week to help clear your scalp of dandruff. Learn about the difference between dandruff and a dry scalp and what you can do to remedy both conditions. You can even use sea salt to strengthen your nails and remove dead skin from the cuticles. The antimicrobial properties of sea salt can also help to remove germs and bacteria that can cause infections. Mix one teaspoon sea salt and one teaspoon baking soda with a little lemon juice. Add 2 or 3 drops of lavender oil and mix well. Pour into the mixture 4 fl. oz. (120 ml) warm water and mix to combine the ingredients. Soak your nails in the sea salt mixture for 10 minutes to get rid of germs and soften the skin. Brush with a soft nail brush. Rinse with warm water and apply your favorite natural hand cream to protect your skin and nails. Find out what you can do to get rid of nail fungus naturally and quickly. How can using Dead Sea salt benefit your skin? Dead Sea salt benefits your skin because it helps to prevent dry skin and symptoms like itchiness and cracked skin. Regularly applying lotions containing Dead Sea salt can help smooth your skin and give it a more youthful appearance. The mineral content of Dead Sea salt makes it an excellent natural treatment for eczema and psoriasis. Specific scientific studies have shown the effectiveness of bathing in Dead Sea salt solutions to treat inflammatory skin conditions. If you suffer from psoriasis, you can find other ways to relieve psoriasis naturally. The anti-inflammatory effect of Dead Sea salt bathing can also reduce painful inflammation in joints. Mix 1/2 cup each of Dead Sea salt and Epsom salt and add to your bath water. Epsom salt bath is fantastic for relaxing and detoxing your body and getting the health benefits of magnesium. Other benefits of Epsom salt baths include relief from stiff joints and tight muscles, arthritis pain and swelling. Read more about it in my article about Epsom salt bath and foot soak – benefits and recipes. Mix 1/2 cup each of Dead Sea salt and your favorite clay (such as bentonite clay, green clay or white clay) and add to your bath water. Clay baths help to detox the body, as well as soften and rejuvenate your skin. You can find more information in my article on how to use clay for body detox and great skin. Mix 1/2 cup each of Dead Sea salt and baking soda and add to your bath water. Baking soda has fantastic cleansing ability and its alkalinity in warm bath helps to soothe skin irritations. Baking soda water has antibacterial and antimicrobial properties and helps to reduce inflammation.